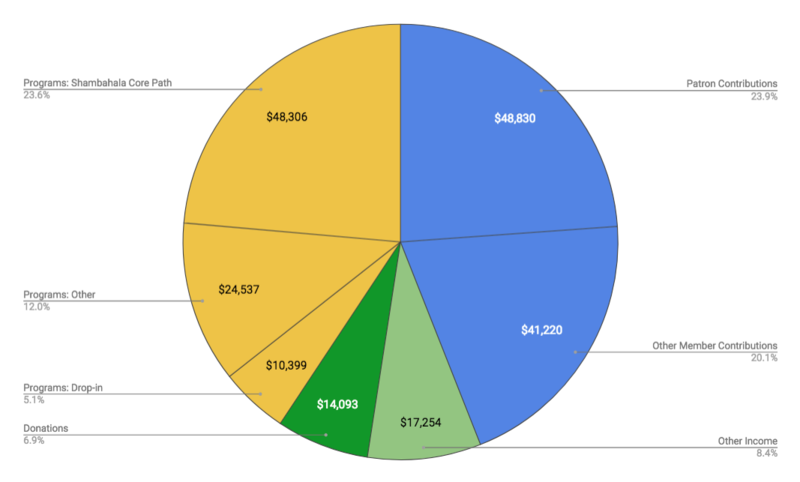 The income generated at Shambhala Boston comes from the following four sources: membership dues, program revenue, donations, and other income. Membership Dues: This year, we are highlighting that Patron Contributions (gifts of $1,200 or more annually) account for 23.9% of the overall income. All other membership dues account for an additional 20.1%. Therefore, 45% of the income comes from membership dues. Program revenue accounts for 40.7% of the overall income. As you can see in the pie chart, we broke that down into Shambhala Core Path programs, other programs, and drop-in programs, such as Open House, Thirties & Under, Nynthun, Heart of Recovery, and the LGBTQ Meditation Group. In a change from the way our income was previously reported, this is gross program revenue, meaning before we take out the program expenses. You will see the program expenses further down. Donations covers 6.9% of the overall income. These consist of one-time donations, cash left in the donation bowl that is not attached to a program, and donations given at Nyida Days (i.e., Shambhala Day and Harvest of Peace). The donations given at Shambhala Day and Harvest of Peace also support Shambhala International. Other income, which accounts for 8.4% of the overall income comes from parking rentals behind the building, space rentals for yoga and other classes or workshops, book sales, and interest on bank accounts. While this is a small portion of the overall income, it is helpful and fairly reliable income. The paid staff must allocate some of their time for managing the rentals and book store. This reliable income can be especially helpful in the summer months when we are not running as many programs. 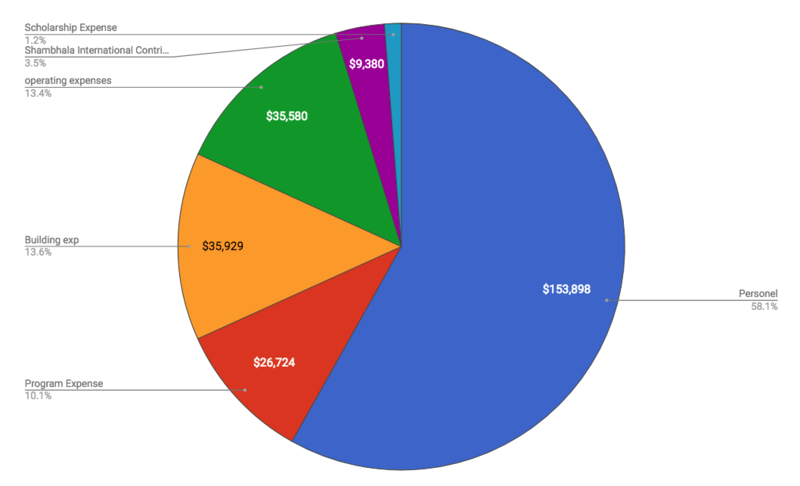 Expenses are broken down into six main categories: building expenses, operating expenses, program expenses, scholarships offered, contributions to Shambhala International, and personnel expenses. Building expenses cover the building insurance, utilities, furniture, and repairs and maintenance. Except when a catastrophe happens, like the HVAC system failing, these expenses are fairly predictable. Building expenses account for 13.6% of the total expenses. Operating expenses is a pretty big catchall category that includes mortgage interest, advertising, general supplies, cleaning and upkeep, shrine and practice materials, center liquor, books purchased for sale, community events, director donations, printing, and postage. This category accounts for 13.4% of the overall expenses, which is a pretty small amount considering all the things that are covered in it. Program expenses include teacher honoraria, teacher/staff travel, teacher hospitality, flowers, food, and program materials. These expenses account for 10.1% of the overall expenses. Scholarships offered are funds used to allow members to attend core path programs at land retreat centers so that they may deepen their practice and commitment to Shambhala. Contributions to Shambhala International are part of the Unified Giving model. These are funds we send to the Center of the Mandala in order to support the work the Sakyong does and to support continuing to unify our community. We aspire to increase our annual percentage every year. In 2017, 3.5% of our expenses were contributions to SI. Personnel expenses are often the biggest expense in most organizations and certainly in nonprofit organizations. Payroll, payroll taxes, workmans’ compensation, payroll fees, and contract labor account for 58.1% of the overall expenses. This is entirely consistent with previous years when Shambhala Boston was running at full capacity. The staff includes a full-time Executive Director (Ashley Hodson), full-time Deputy Director (Max Roberts-Zirker), full-time Marketing and Program Manager (Nicole Arseneault), part-time Bookkeeper (Natalie Greening), and now, a part-time Teacher Development person, (Nick Kranz). Bottom line: As you can see, we ended 2017 significantly in the red. This does not mean we owe any money other than the mortgage on the building at 646 Brookline Ave. We had a buffer of savings from 2014 when we were significantly understaffed, and we continue to have savings from refinancing the mortgage on our property in order to grow our outreach efforts. The ongoing inquiry revolves around whether we should focus our energy on increasing membership dues or increasing program revenue. Increasing membership dues takes time; cultivating new members doesn’t happen overnight. Increasing program revenue requires additional space, additional teachers, additional volunteers, and access to a broader range of potential participants. Since coming onto our staff, Nick Kranz is working hard to increase our teaching core, so we can offer programs in other locations throughout the city. This will give us access to additional program revenue, with low overhead, and potentially a broad pool of people who will become contributing members.